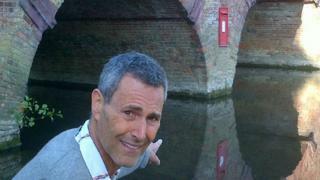 When a postbox mysteriously appeared on the side of a bridge last year it made international headlines and flummoxed spoon bender extraordinaire Uri Geller. But who is the prankster behind this and many other japes? Bizarre art installations have been cropping up on roundabouts, bridges and rivers in south-east England. A large, red Google Maps pin turned up at a busy roundabout and a park bench was found "floating" on the River Thames. And there was plenty scratching of heads this month when a new sign was added to the side of a bridge, warning boat drivers of the risks of skidding. The man behind them prefers not to give his real name, but he is the artist known as Impro. "It's just to make life a little more magical," he says. "A bit like finding Easter eggs in an Easter egg hunt. It's something that you don't expect to find." It was a jape in September that brought Impro his biggest audience so far when he placed a a fake letterbox on a buttress of the Sonning Bridge in Berkshire a couple of feet above water level. The problem is that we are encouraged to take life seriously despite the fact that it's absurd and tragic. Local resident Uri Geller was mystified. He said: "I have never seen anything like this anywhere in the world. It's a new one on me." He even suggested a possible culprit - the "ghost of a mischievous little girl" who had been apparently seen walking on the bridge. The Royal Mail were forced to respond, saying it was "certainly not an operational posting facility" and that they had "no knowledge of how it arrived". Impro is evasive on how he got it there, but puts its success down to being "well placed and looking right in its location". "In the old days people would see something, enjoy it and walk on, but now with phone cameras and social media things spread a lot quicker," he says. "It's amusing to set out a jape in the morning and then do a Google search for it in the afternoon and there it is." Impro is now in his 50s and lives somewhere in Oxfordshire. He caught the pranking bug at college, flipping portraits of "pillars of the community" so they were upside down. Once he made a concrete sandcastle on the beach and then watched the reactions of the locals from a secret vantage point. "It was fun to see boys periodically attempting to destroy it and come a cropper," he says. "It was also fun to see it be consumed by the advancing tide and then emerge again intact. It's a small thing but these things keep me going." He went on to do a series of stunts that were generally "boozy fun" after nights out. They soon gave way to more elaborate schemes on his local stretch of the River Thames. They included the top of a Russian submarine sticking out from the water's surface, a floating bench for "ducks and brave fishermen", and directional traffic bollards. Each time he would use the "magic hour" between 03:00 and 04:00 when the "late night people have gone to bed and the early risers haven't got up yet". The Playhatch Roundabout, on the A4155 Reading to Henley road, became a favourite site, being highly visible to commuters. It has played host to a front door, a graveyard, and the giant Google pin. "Most people simply don't see the quirks and subtle strangenesses in life," he says. "If you put a large red door on a roundabout, there are a large number of people who are so wrapped up in their world that they simply don't see it. "Some people however do and you could say that those who can see the door can also go through it. It's a door of perception. "In the same way with the Google pin, if what you are looking for is here, then you've found it. It's a recursive jape, the most sophisticated type." According to Alan Oxlade, owner of The Shoulder of Mutton pub in Playhatch, the identity of the artist and the meaning behind his pieces had often been debated by regulars. "Invariably we have no idea but it's always a bit of a surprise," he says. "It livens the place up and creates a talking point. "We wondered if the Google Maps thing had a tie in with Google for a little while, and obviously it didn't." These artwork interventions make us look and think twice about our daily reality. After each stunt Impro returns the next day to see what it looks like in the daylight and to pick up on local reactions. "When I did a traffic island there was a man there walking his dog who was outraged that the council was wasting money managing traffic lanes in a little used branch of the River Thames. "Needless to say I agreed with him and promised to write a letter of complaint." But does this form of expression impress the rest of the arts community? Oxford gallery director Aidan Meller admits he is a "big fan". "This whole phenomena started with graffiti art and Banksy and Blek le Rat... and in my own view we've been doing this for hundreds of years with Punch magazine, with satirists commenting on daily life. "Our newspapers are full of comments on life's parodies. This is an artistic form of that. "Some of the comments that they make are very well worth making, and if it translates into an accessible work that people can understand then all the better." Helen Statham, director of the city's O3 Gallery, described them as "surreal and witty". "These artwork interventions make us look and think twice about our daily reality. "What imbues the Oxfordshire Google maps icon with its own originality is that it is precisely nowhere, placed in the middle of a roundabout island, thus highlighting the often arbitrary 'authoritative tone' of the internet." As for Geller, once he learned the truth about the postbox, he had some advice for Impro. "Whoever this chap is, good for him," he says. "He's done a brilliant art installation, indeed it was so brilliant it was picked up by the world's press. "He's making one devastating mistake if he cares about his career and that is not revealing his name. So he should absolutely tell you who he is because otherwise he's done it for nothing." But Impro insists that his anonymity is necessary because "councils don't really have that kind of sense of humour" and "take life very seriously". "I really don't want to stand up [and try] to explain to a po-faced and humourless court why I have done things which are essentially humorous and whimsical. "It would feel too much like school where teachers are always pretending to be angry or disappointed by naughty behaviours which they in reality think are quite funny." He says his art is inspired by his belief that people are encouraged to take life seriously "despite the fact that it's absurd and tragic". "We are encouraged to act responsibly, we are encouraged to go off to work every day to, by and large, do something pointless in order to sustain a meagre existence, so that we can go to work again, and are released from this cycle when all joy and spirit has been squeezed from us," he says. "We are encouraged to get to our grave safely and responsibly, and if possible with an insurance policy to help with 'those funeral expenses'. "We are encouraged to buy tat we don't want with money we don't have. "What I do is not that."